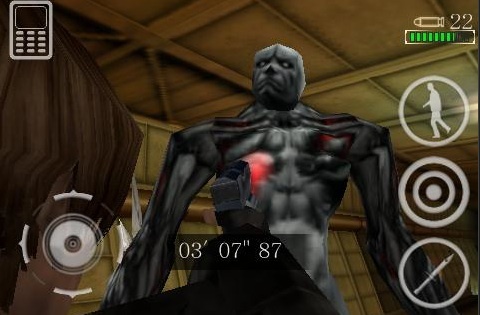 Capcom's Resident Evil game for iPhone degenerates into madness, and not in a good way. Resident Evil: Degeneration marks the debut of Capcom's survival horror franchise on the iPhone. It closely follows the events of the CG animated movie of the same name, as you guide Leon Kennedy through an airport filled with infected zombies that want nothing more than to devour human flesh. It sounds like an exciting game, but Degeneration drags along like a walking corpse. Part of the problem is with the game's pacing. If this were a fast-paced Resident Evil affair along the lines of Resident Evil 5 or the upcoming Darkside Chronicles, it'd be a swell time. Unfortunately, it isn't. 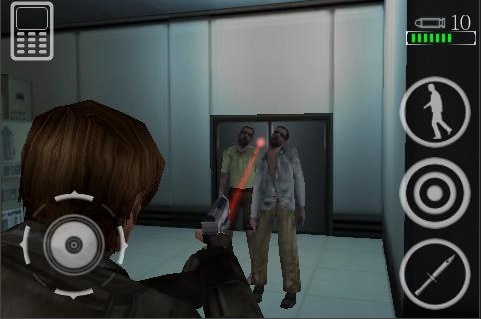 Kennedy must complete several missions over the course of a game, including saving a ne'er do well senator and gathering key cards to access new areas. This means going through rooms, shooting zombies and then doing it all over again. Despite the presence of the undead, there's few surprises in Degeneration, and you may find yourself holding back yawns as a result. The rest of the problem lies in the game's controls. Degeneration isn't unplayable by any means, but it's not nearly as much fun as it should be. Most of the time, you'll guide Kennedy using an on-screen control stick, aiming up and down with your gun while controlling left and right movement with thumb swipes. It works OK, but the fact that you can't run and gun (a problem that exists in more than one Resident Evil game) leaves you wide open to attack by surrounding zombies. Then there are the motion controls. You have to manually reload your weapon by tilting your iPhone down and lifting it back up again. It's an annoying play technique that could've been resolved with a simple "reload" button. Shaking off zombies is equally bothersome, as you'll have trouble seeing if they're still on you. At least the menu item screens are easy to navigate, so you can keep track of your herbs, key cards and weapons. Degeneration takes roughly three hours to complete, and once you beat it, you'll unlock a more exciting Mercenaries mode. Here, you don't have to worry so much about item collection as you do surviving a zombie horde. It's a shame that Capcom didn't unlock this from the start, as it's more fun than the actual story mode. On the positive side, Degeneration looks impressive. The 3-D environments are well designed, small and cramped to create a mild sense of hysteria as you hear zombies moaning through the halls; the animation is equally impressive. The only downside is the camera. At times, you'll end up right behind Kennedy, unable to get a clean view of the undead zombies and dogs ahead of you. Although you can readjust it, that takes a few seconds of your precious time. Overall, Degeneration is a disappointing chapter in the Resident Evil franchise. Had Capcom reconfigured (and tightened) the controls and unlocked Mercenaries Mode from the start, it would've been better. As it is, it feels like a misfire, and that's the last thing you want in a zombie game. What's Hot: Nice visuals, Mercenaries Mode is a good challenge (once you unlock it), solid sound effects, a good portion of zombie shooting. What's Not: Completing missions and finding key cards is monotonous and throws off the game's pacing, both the on-screen controls and motion controls have issues, camera problems.